” (Sep, 24th at 14:00). ” (Sep, 25th at 11:30). The IEEE Journal of Selected Topics in Quantum Electronics (JSTQE) invites manuscript submissions in the area of Foundry-Enabled Photonic Integrated Circuits. The purpose of this issue of JSTQE is to highlight the recent progress and trends in foundries and associated technologies to develop volume manufacturing of photonic integrated circuits. Submission deadline is December 1st, 2018. 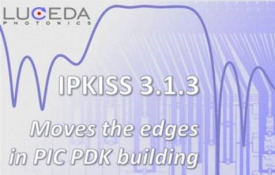 The IPKISS PDK combines circuit level design, simulation and layout in one single quality-controlled PDK. Mature organizations can now take a big leap forward and create a design flow that is more reliable and scalable and that will enable them to consolidate their knowledge in a fast-moving industry. As a model builder you are now assured that layout, circuit and physical simulation models are completely integrated. The new IPKISS PDK is useable from IPKISS.flow and IPKISS.eda and integrated in the Mentor / Tanner flow. This means no more hassle of having to combine PDKs from different vendors. 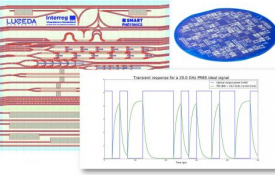 SMART Photonics is the world’s first pure-play foundry for Indium Phosphide photonics, which often provides the best choice in many applications ranging from next generation data-centers to a variety of sensing applications. 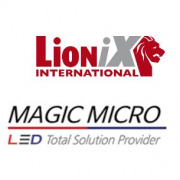 Magic Micro, a Kosdaq-listed South Korean electronic component company, has acquired a majority share of 75% in LioniX International. 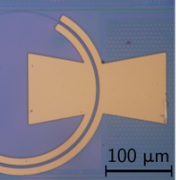 This acquisition between two complementary companies strengthens the position of both and clearly shows the Photonic Integrated Circuit (PIC) based ecosystem is further maturing. aims to contribute to making photonic integrated transmitters cheaper and more power efficient. The consortium of 8 partners and coordinated by Aristotle University of Thessaloniki (AUTH), Greece, intends to monolithically integrate InP QD laser structures on a passive SiN waveguide platform to demonstrate new high-performance cooler-less transmitter modules for a broad range of applications. ‘s Thick-SOI platform, where Tampere University of Technology adds III-V light sources. 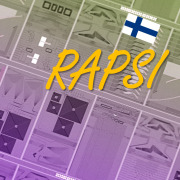 Industrial partners are Rockley Photonics, Vaisala, Okmetic, VTT Memsfab, Beneq, TTM Technologies and Noptel. 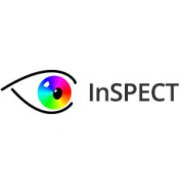 Last week the H2020 project called InSPECT was successfully finalized by showing several demonstrators. In the project, different spectrometry principles were investigated for spectral tissue sensing. This is used in photonic needles and allows surgeons to understand better where they are inside of the body. LioniX International showed a demonstrator based on TriPleX waveguide technology, covering the range from 400 to 1700nm with a resolution of 6nm. 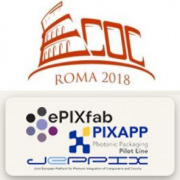 The European Conference on Optical Communication, featuring the latest progress in optical communication technologies, awaits more than 1,000 scientists and researchers from across the world from September 23-27th 2018 in Rome. During September 30 – October 5, 2018, the Photonics Applications Week (PHAPPS Week) will take place in Eindhoven, The Netherlands. Solely focused on Applications of Photonics and what it can bring to your industry / business. European Optical Society Biennial Meeting (EOSAM) will be held at the Delft University of Technology, October 08 – 12, 2018 where the latest results in optics and photonics research will be presented. 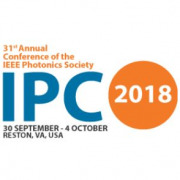 The IEEE Photonics Conference features technical presentations by scientists and engineers in the research areas of lasers, optoelectronics, optical fiber networks, and applications for photonics. Additionally, the conference stages plenary talks on the industry’s most important issues, weekend events aimed at students and young photonics professionals, and a manufacturer’s exhibition. Towards denser integration of silicon photonic circuits, overcoming the diffraction limit becomes a major roadblock. A team from Nanophotonics Technology Center (NTC) at Universitat Politecnica de Valencia demonstrated absorption and loss manipulation in deeply-subwavelength metal nanostructures supporting plasmonic resonances by controlling the phase difference between two counter-propagating guided waves. This could pave the way towards all-optical coherent processing in silicon chips without nonlinearities. 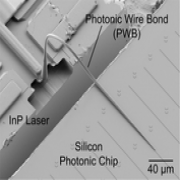 Silicon nitride (SiN) is emerging as a competitive platform for integrated photonics, but still lacks modulators with high bandwidth, good modulation efficiency, low loss, and covering a wide wavelength range. A research team from Gent University was now able to demonstrate the first electro-optic modulators based on ferroelectric lead zirconate titanate (PZT) films on SiN, in both the O-band and C-band. This approach offers a much-anticipated route towards high-performance phase modulators on SiN. A team of researchers led by the University of Bristol have demonstrated a fully programmable two-qubit quantum processor, enabling universal two-qubit quantum information processing in optics. 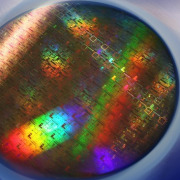 The quantum processor is fabricated with mature CMOS-compatible processing and comprises more than 200 photonic components. They implement 98 different two-qubit unitary operations and argue that the linear-combination architecture with silicon photonics could foster further use for future photonic quantum processors. The world’s largest photonics technologies event, consisting of three conferences and two world-class exhibitions will take place from the 27th of January to 1st of February 2018 in San Fransisco. Abstracts are due July 25th for Photonics West 2019. The largest global conference and exhibition for optical communications and networking professionals will take place in San Diego, CA from March 3-7th, 2019. OFC provides insights on the major trends and technology advances affecting the industry. The call for papers is open, with a submission deadline of 9 October 2018. 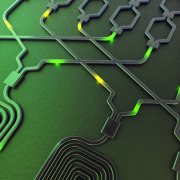 The Photonic Integrated Circuits International conference 2019 will host three cutting edge complementary conferences and one dedicated exhibition featuring leading players from across the globe. 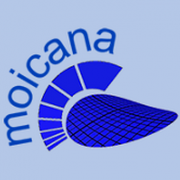 It will be held from March 26th to 27th in Brussels, Belgium.